"A great camp ! Excellent service and a wonderful atmosphere. We had a very spacious 2 bedroomed family tent, a beautifully designed bathroom with 2 wash basins and 2 showers, one inside and the other outdoors. We also had a large balcony with a view over the water where we watched elephants and hippos. There was no limit on the amount of washing and we were able to get everything washed including underwear and socks which nowhere else offered to do ! The meals were very good and once again gluten free options were available for my son. The sleep out in the bush was exciting though we were rather nervous. An excellent camp for bird watchers especially from a Mokoro. ( boat ) "
"Tents very good and place well done. A little closer to each other than others we stayed, not so private as you could see in each otherâ€™s tents. Lack of vibe due to lack of guests some nights, and mix of guests. Nice location by the water. Choice of Safari mixing boat, mokoro and jeep was great. pfefo was a great guide, currently only an assistant but should be promoted ! Food was extremely disappointing and not on a par with others on our holiday. Substitute dishes for dietary needs were terrible. Staff were a little were regimented in their style felt a little forced. Managers joked about everything! In a well intended but misguided attempt to socialise. Bizarre! Thanks for organising sleep out deck unfortunately due to wether unable to experience." "The camp is good but nowhere near as good as Shinde. The only thing that was better was that electricity was on all night (they do have solar power though) and having fans in the tents helped enormously. Our driver was good but someone should teach him how to drive off road. Also the atmosphere in the camp was not as pleasant/cosy as in Shinde. We had the impression that everybody was simply doing their job and generally the staff did not care too much what clients wanted. Shame. " "We received a welcome like no other! Dancing and singing by the camp staff is a highlight. The lounge and dining areas are lovely and the staff very attentive. The rooms are simple framed buildings on the outside, and beautifully furnished inside. Amazing service." "The way the Kanana facility is designed not only helps it blend into the surounding environment, but facilitates the return of the area to it's natural state quickly when it is eventually dismantled: it is as if the area has been 'borrowed' from the wildlife for a short period. The accommodation is described as a 'luxury tent' and was exactly that. All of the staff were cheerful, helpful and efficient providing excellent food and service. I would strongly recommend this camp to anyone planning a similar trip." "Really beautiful camp, fabulous staff who went out of their way to make our stay truly special.....loved it! " "The camp had an intimate and sociable atmosphere. 'Tents' were excellent and very comfortable. A visit to the Heronry is a must.They are just about to refurbish which we were surprised to hear. Isaac, our guide, was great and we wish him all the best at Disney World come July." "From the choir greetings to departure this camp was a real treat. All the staff were so friendly, welcoming and accomodating and the guide, Amos, worked tirelessly to make sure we saw as much as possible in this area. The birthday cakes made for our neice were especially memorable! Following a pair of lions chase off an interloping lioness was the highlight from this visit. " "A luxurious camp that had a friendly atmosphere and was very well managed. We had very personal service and were able to choose which activiites we wished to do each day. Often there was just the two of us on a drive. I needed a special diet and the staff were tremendous, ensuring that I always had plenty of delicious food." "Wonderful tented camp with excellent food and choice of activities. Intimate and close to wildlife (elephants in camp overnight). Lovely areas for eating and relaxing." "Very comfortable accommodation and fabulous staff. Really enjoyed the mokoro trip, spotting wildlife from tiny frogs to elephants. It was good to have the chance of a walk too." "Slightly quirky but excellent hostess. Food and accomodation excellent." "Wonderful accomodation, lovely food, a great welcome and the trip to the heronry will remain one of my best memories for ever." 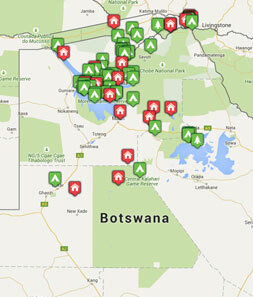 Start planning your tailor-made holiday to Botswana. Tell us what you want, and we will tailor make your perfect trip.  Flight time: Overnight flights to Johannesburg then connections to Maun, total flying time about 13 hours.  Language: The official language is English. Tswana is spoken widely.  Health: There are no compulsory vaccinations, except yellow fever if you are coming from an infected area. Malaria prophylactics are recommended in the north.